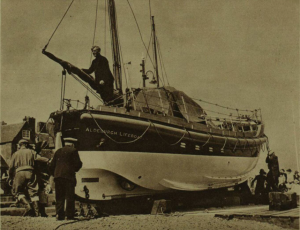 A device which aids in the rapid turn-round of a lifeboat: the Aldeburgh Lifeboat, Abdy Beauclerk, on a special turntable on the new slipway. On this slipway, the boat can be brought ashore at any tide and immediately and easily turned round for a fresh launching. The 75th Aldeburgh Carnival needs YOU! Could you be an On-Call Firefighter?